WHAT IS IT? The Model CRU is an advanced version of our standard rotating paddle style level control designed to provide a positive indication that the unit is functioning properly. The failsafe detection is based on our proven motion control technology. WHY IS IT NECESSARY? The Model CRU is appropriate for critical applications where spillage or overfill is detrimental to the process or the environment, or to the safety of personnel. The Model CRU not only monitors the process, it monitors itself. Epoxy coating option: add $12.00 to price, add "E" to end of model number. Typical cardboard shipping carton measures 15" x 11" x 9" each. CR-90 1/8" Pipe Shaft Extension 0.026/in. $0.78/in. CR-100 1-1/4" Pipe Shaft Guard 0.189/in. $0.78/in. CR-91 1/8" 303 S.S. Solid Shaft Extension 0.037/in. $1.15/in. CR-101 1-1/4" 304 S.S. Pipe Shaft Guard 0.189/in. $3.44/in. 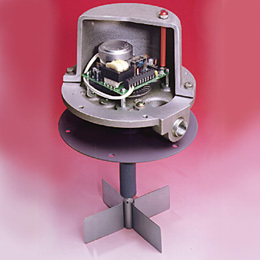 The housing is cast aluminum, with optional epoxy or polyester coating available. These coatings will provide additional protection against corrosion. The unit is designed with a field selectable high level or low level failsafe output. The unit is mounted on the vessel using the mounting plate or by use of a 1-1/4" NPT half coupling. General purpose (weatherproof) units and dust ignitionproof units have (1) 3/4" NPT conduit opening. The units has a dry, unpowered DP/DT relay rated for 10A @ 120 VAC or 240 VAC. Highly visible external LED (light) provides a visual indication that the unit is operating. The operating temperature range is -40ºF (-40ºC) to 150ºF (65ºC). The general-purpose units are designed to meet NEMA 4/5 weatherproof and dust-tight, and the "X" units are designed to meet NEMA 9 for dust ignitionproof.